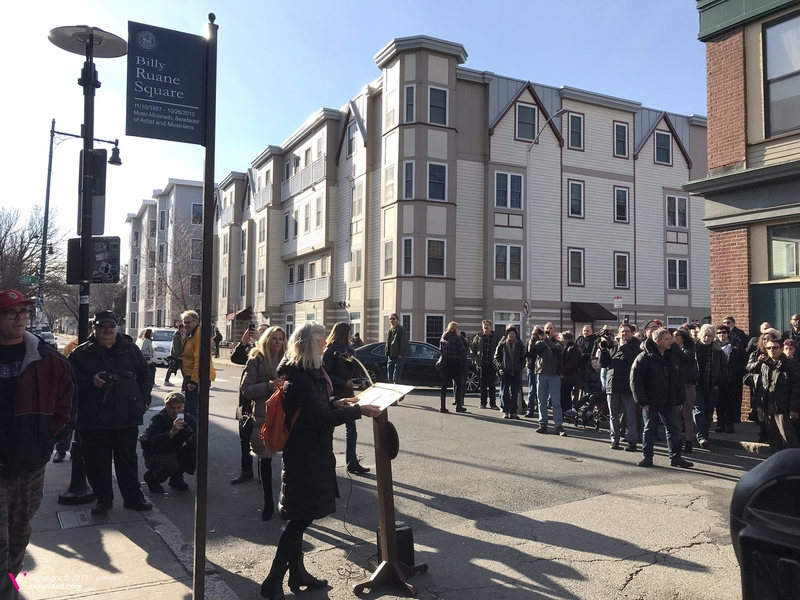 A large crowd gathered along Brookline Street in Cambridge’s Central Square this afternoon (December 1), and like countless times before it over the past 30 or so years, it was caused by Billy Ruane. 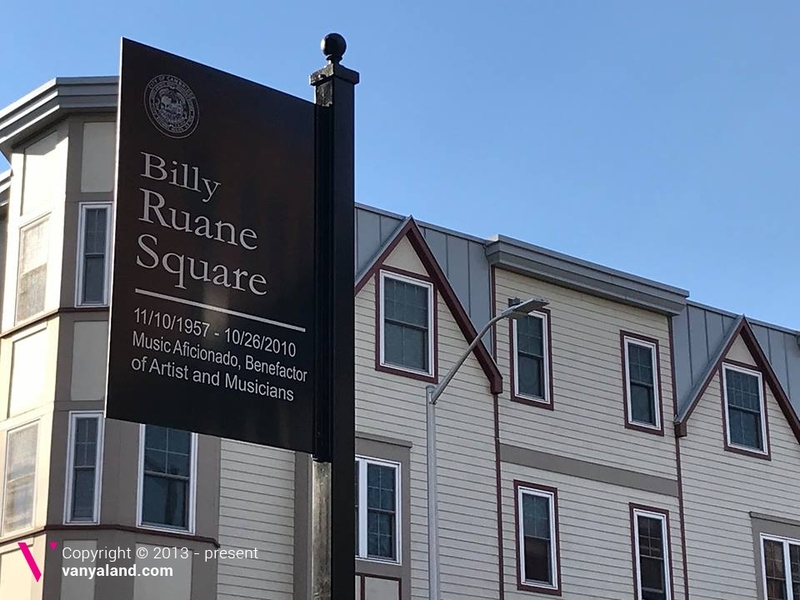 The one-of-a-kind Boston music scene icon, who passed away in October 2010 at the age of 52, was immortalized today as “Billy Ruane Square” now marks the corner of Brookline and Green streets. A marker was unveiled outside Sonia, the former space of T.T. The Bear’s Place, by the City of Cambridge and Vice Mayor Jan Devereux, who addressed a crowd so large it spilled into the street, causing minor delays for drivers passing through and capturing the attention of all pedestrians in the area. A symphony of car horns blared as a proclamation was read by Devereux, and Ruane’s family, friends, and colleagues shared stories and laughs. Up next was Devereux, who equated the gathering of onlookers to those waiting in line for a show at the nearby venues, suggesting that felt just about perfect. “It’s certainly very appropriate for the dedication we’re doing today,” she added. Though the party aspect of Billy Ruane’s dedication would evenutally lead back to The Middle East, where his ashes rest in the restaurant’s entranceway to its Upstairs music venue, many took the mic at the podium to share thoughts and stories. Music writer Jim Sullivan joked about how Ruane was banned, for certain time periods, at all the clubs in town, including the two behind the dedication ceremony, only to always be let back in. And Francis Dimenno noted how he wished Ruane was there to see all the action on this December day. The last to speak at the outdoor dedication was Shawn Devlin of Dumptruck, who kept it short and sweet. “I kissed Billy on the lips,” Devlin said, and the crowd roared in its approval. It felt like a big, wet, sloppy kiss from Ruane himself. All photos by Michael Marotta for Vanyaland.